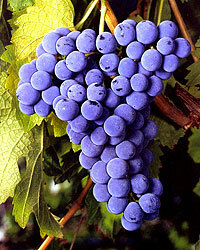 Cabernet Franc is one of the major red grape varieties worldwide. It is principally grown for blending with Cabernet Sauvignon and Merlot in the Bordeaux style, but can also be vinified alone, as in the Loire’s Chinon. In addition to being used in blends and produced as a varietal in Canada and the United States it is made into ice wine there. Records of Cabernet Franc in Bordeaux go back to the end of the 18th century; it was planted in Loire long before that. DNA analysis indicates Cabernet Franc is one of two parents of Cabernet Sauvignon, a cross between it and Sauvignon Blanc. Cabernet Franc is currently produced in over 200 California wineries, including Alexander & Wayne in Los Olivos, Byington in Los Gatos and Dubé in Jamul.